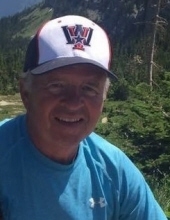 James L. (Jim, Jimmy) Johnston, 74years, lifelong resident Of Coeur d’ Alene, passed away April 8, 2019. Jim was born at Farragut Naval Base on September 26th, 1944 to Bonnie LeCain Johnston and Robert Johnston. The first several years of his life he lived next door to his grandparents, Avery and Stella LeCain. They provided a second loving home for him and were a guiding force in his life. Jim loved his children and grandchildren with all his heart. There was nothing in his life more important to him than his family. He loved spending time with his grandchildren. Always known as Grandad, he would play Scrabble and cards, take them for walks, teach them how to use wood working tools and attend their many sport events. He would put on his team logo hat and head to the field to cheer them on. Jim is survived by his son Ben Johnston, daughter Jen Barnett, son-in-law Eric Barnett, grandchildren Rylee Johnston, Parker Johnston, Carson Barnett and Hadley Barnett and his sister and brother-in-law Janice and Dan Wright. In lieu of flowers, the family requests donations to Matt’s Place Foundation Inc. P.O. Box 2673 Coeur d’Alene, ID 83816 USA, an account at Idaho Independent Bank has been set up for this purpose. The Memorial Service will be held at 1:00 p.m. on Wednesday, April 24th at the First Presbyterian Church in Coeur d’Alene. A light reception of Cookies and Coffee will follow the service at the Church. To send flowers or a remembrance gift to the family of James "Jim" Lee Johnston, please visit our Tribute Store. Guaranteed delivery before James "Jim"'s memorial service begins. An account at Idaho Independent Bank has been set up for this purpose. "Email Address" would like to share the life celebration of James "Jim" Lee Johnston. Click on the "link" to go to share a favorite memory or leave a condolence message for the family.